The Iridium GO! 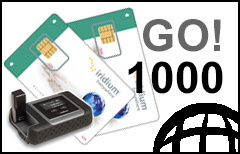 1000-min Prepaid Plan provides a discounted rate for Iridium GO! data calls throughout the Iridium's global satellite coverage. This SIM-card and prepaid plan can be used with any Iridium GO! terminal or satellite phone. The discounted GO! Data rate will only apply to data calls made with an Iridium GO! terminal. Data calls made with other Iridium devices will be charged at the regular voice rate. Do not purchase a new plan if you just want to add more minutes or extend validity of your existing Iridium account with SATTRANS. Get an Iridium airtime voucher instead. Returns and Cancellations. You can request a cancellation only if the SIM has not yet been activated. Terms and conditions will apply.